South Facing on the water, Watch Beautiful sunrises & stunning sunsets! Heron's Rest villa is a secluded south facing villa. Excellent choice for families as well as for couples who want to get away from it all. The villa is open-plan with a bright and spacious feel throughout. Well equipped with everyday, modern conveniences. This delightful sunny villa, boasts a large patio area looking out onto a 23x13ft heated swimming pool. Beyond this is a lovely view of the inland waterway. The wall-to-wall patio doors in the living room and dining area overlook the screened patio and pool, where you can breakfast as the sun rises or enjoy evening dining as it sets! A further sun-deck and pretty garden leads to the waterway docking, where you can fish or just relax. Sun loungers, golf clubs, bicycles and tennis racquet's are all provided. Fishing rods for use off the dock and beach gear for the beautiful beaches within 10 mins drive. Use of free wireless broadband internet. Full size pool table to enjoy and Spinning bike to keep fit on! We want you to use and enjoy all we provide there to make your stay that little bit more special. Whether families or couples you will find everything you need! Hi, I am English, my wife American. We live in the UK, married for over 33 years now, we have two grown up daughters. One is now training to be a doctor, the other in law. So they should both be able to take care of all our needs as we grow older! We visit family in Florida regularly and now own our own piece of it in Rotonda. I jog to keep fit, my wife shops! We just love it here, not just the sun, but the whole area is unique, unspoiled and special. You will have the most relaxing, " Get away from it all", fun time here! Do read the guest reviews people have e mailed to me. We just fell in love with this area of SW Florida! Its non commercialised, not spoilt, a real taste still of local, community, Florida. Real people still live here! Beaches are fabulous! Uncrowded white sand with the most incredible sunsets over the gulf. When we decided to buy here we wanted not just a vacation villa, but a home situated in the very best area of Rotonda and in the perfect position. Secluded, south facing on the waterway. Villa is equipped to the very highest standards, besides it is our home! For me 10 minutes to the beach! for my wife 10 minutes to shopping! its away from it all, yet has all you need to hand. Walking, cycling or we like to jog, around Rotonda, spotting wildlife as we go. The Villa backing on to waterway means you can sunbathe, relax and dine on the patio with a glass of something special as the sun sets! or why not rise early to see it glow over the water! Where else can you relax and watch the local wildlife play? Herons rest on the fishing boat dock, otters play and fish for supper, Cranes, birds of all varieties. Spot the Alligators as they glide by. Master bathroom with walk-in 'rain' shower. Twin basins. Family bathroom with full size bath and shower. All towels/line provided. Hair dryers x 2. Full sized pool table and Spinning exercise bike. Air-conditioned, large bright and spacious open-plan living room, with wall to wall patio doors looking out onto pool and deck areas, with undercover dining outside. Wide screen TV, HD cable! Beautifully furnished. Separate dining area off kitchen. Equipped with everything you will need! Cooker, microwave, dishwasher, coffee maker, kettle, crockery, glasses, cutlery and utensils. Fridge/freezer. Plastic ware provided for the pool area/beach. Breakfast bar and dining area. Even champagne glasses! The area is full of golf courses! 6 on Rotonda alone! With prices for a 9- hole ranging from $15-$30. There are also opportunities to play golf all day and all week if desired. Notes on accommodation: Villa is air-conditioned. Open-plan style, bright and spacious with large living room area, separate dining suite. Suitable for couples or families of all ages, child friendly with travel cot and high chair provided foc.Our local management team are available anytime of the day for any issue that might arise. Guest information pack with information such as the street maps local restaurants, golf courses, beaches and other interesting things one can do. 5 bicycles are available to use. Local bike paths, lead through out the area which is abundant with wildlife and special interest. Several Calloway golf club sets for use on the 6 local golf courses on Rotonda alone! Fishing rods for fishing from our private dock. Tennis racquets for the local free courts. There is free wifi. All rooms have TVs, Ample sun loungers and sun chairs provided. Outside: The villa is situated in the exclusive, peaceful area of White Marsh, where the pace of life is slow and unhurried. Lovely area to cycle around or walk. Enjoying a secluded position, villa has a pretty outside garden, fenced for privacy and security. Wildlife visit! with herons landing on the dock area for rest! Own 23 x 13ft heated swimming pool. Large south-facing sun deck/screened lanai area, outside dining area. Additional garden sun deck area looking out onto water ways. Internal waterways of Rotonda back onto villa, which has it's own private boating/fishing dock. The perfect place to while way the time in the sun and watch the sun rise or set! BBQ provided. Front drive has ample parking. Local neighborhood is one of the newer developments, spacious and un-spoilt. Utility Room: Washer and dryer. Iron and ironing board. Cleaning / Towels / Linen / Maid service: All towels and linen provided. Villa is cleaned prior to each visit. Please leave it as you would like to find it! Thank you. Child-friendly with travel cot and high chair provided. Other: A small alcove from the kitchen houses an 'office', complete with a desk, wireless internet access, fax/telephone with free local calls. Comfortable, everything we needed and then some. We very much enjoyed our stay. The property was clean and had everything we needed. We would rent this property again. This was our first time renting a home. The home was awesome!! My father in law could not stop raving about how nice it was. My son loved going to the dock in the morning and fishing and looking for alligators and my wife loved just hanging by the pool in the morning. We can't wait to stay here again. Thanks!! Peaceful location I have visited on many occasions. Great hub to visit the west coast from Everglades City to Tampa including Busch Gardens. Very comfortable and on the doorstep of a golf course . Backs onto the waterway where you will see an alligator chill out, fish leap and other wildlife enjoy the water. The rooms are spacious, spotless and have good quality furnishing. The standard in Rotonda is high and this villa didn't disappoint. I would return tomorrow and feel at home and in awe. Not too far from Port Charlotte where you will find everything you need, go over the bridge to Punta Gorda, follow the historical route to the fisherman so village for food, non high street shops and boat trips. Boca Grand is a favourite place with beautiful beaches to watch the dolphin pods go by. And enjoy an ice cream. 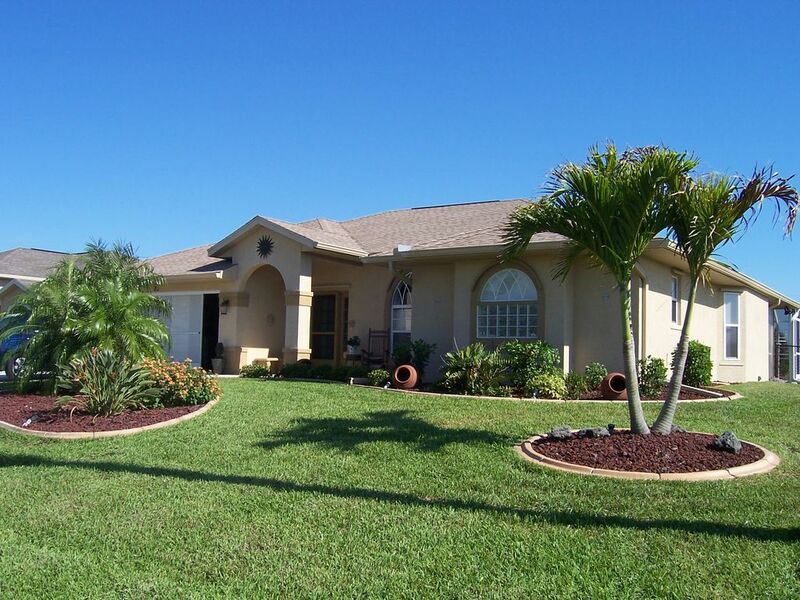 Having stayed in a different villa each time we visit SW Florida over a timespan of 20 years we have found an area we love and a villa we will return to on our next Holiday to Florida. The villa was very spacious and spotlessly clean-no complaints. The pool is quite large-great covered area next to the pool to sit in the quiet and watch the local wildlife. All the equipment in the garage was a blessing- the beach gear for trips to Blind Pass-Boca Grande-Stump Pass beaches(all were quiet and not overcrowded). The bikes for early morning trips around the bike trails- Tennis equipment for use at the local courts at the community park. The fishing gear for early morning fishing sessions from the dock at the bottom of the garden and to watch Gaz the Gator swim by. Definitely recommend Blind Pass beach for Shark tooth hunting or taking in a baseball game on two dollar Wednesday at Port Charlotte Stone Crabs. Like I say great villa- all equipment supplied-comfortable-home from home-lots to do in the area or relax by the pool. Mike the owner is a genuine-caring guy- nothing is two much trouble- any queries you have-very timely response. We will definitely be rebooking on our next visit to Rotonda. Thanks for the use of your lovely home. This property has everything you could possibly need to make your stay enjoyable including golf clubs, bikes and a great pool table. Nice quiet area with lovely canal views and plenty of wildlife (herons, gators, fish, frogs, many other birds) it is nice to sit on the dock in the sun just watching the world go by. The villa is clean, well laid out and fully equipped, never did we think 'if only we had a...'. The south facing pool and lanai are great places to relax in private and enjoy the Rotonda sunshine. Gorgeous Villa. Best part of our holiday! "We were desperate to rent a villa on Rotonda after making the mistake of booking a hotel "for a change" after only ever staying in villas the past 20 years! We hated the restrictions of a hotel room and wanted the freedom of a villa for the remainder of our holiday. Mike responded to our request within minutes saying he would let us rent his villa from the next day for the remainder of our holiday. Within a couple of hours he had sorted everything with his management company and sent us over all the details. Absolutely fantastic! When we arrived at the villa the next day we were so happy. The villa is gorgeous. Spacious and clean with a gorgeous pool and lanai overlooking the canal with a south facing aspect. We had a lovely comfy bed in the master suite and everything we needed in the villa with the kitchen kitted out substainally with everything you could want. We also made use of the bbq which was also fab and had a lovely meal outside overlooking the pool with the sun going down. This was the best part of our holiday, we loved just chilling in the villa, using the bikes provided and also using the cool box to go down and have breakfast on manasota key beach a couple of mornings! We will definitely return to herons rest! We have stayed on the Rotonda many times in different villas and this was definitely one of the best! A big thanks to Mike we are truly thankful to him making our last few days of our holiday memorable! " Thank you, You are so welcome! Do come back again soon ! Beautiful, spacious, uncrowded, white sandy beaches are just 10 minutes away on the Gulf coast. There you can enjoy swimming, fishing, shelling and other beach activities, such as boating, kayaking, jet-skiing, scuba diving. Beach gear, such as chairs, buckets and spades are all provided at the villa! The surrounding area has a wonderful selection of beach locations for you to choose from. There are several quiet and remote island retreats. Fort Myers airport 60 mins, Sarasota airport 45 mins, Tampa airport 90 mins, Orlando airport 2.5 hrs and Miami airport 3 hrs. Car hire definitely recommended. Englewood 10 mins, for local supermarkets providing a vast range of food and wine and deliciously inviting delicatessens. Inland to Port Charlotte, around 15 minutes drive, is an extensive shopping area and mall, with major stores including Macy’s, a large range of restaurants and multiplex cinema. Further afield are huge outlet malls, an experience in themselves. Details are at the villa for all shopaholics! Many people choose a week in the Disney/Orlando area then head for the Gulf Coast for a second week to relax on the coast. However, Rotonda is only a 2.5 hour drive from Orlando and the Disney/Universal/Sea World theme parks. It can be a long day trip, but a stopover at a budget motel means a two-to-three day visit is within easy reach and the journey is very straightforward. Why not make Rotonda your base rather than split your visit? Miami, with its famous South Beach, is just a three hour drive away. Visit a fascinating Indian reservation on the way! Closer still are the Everglades, where you can experience air boat rides and see alligators, all within easy reach. The Fishermans Village in Punta Gorda, 20 mins away, has a beautiful pier with lots of local quaint shops to explore. There is also a factory outlet near Fort Myers. For fishing, many excursions are available locally with some of the best tarpon and shark fishing found anywhere. For long term discount rates contact me direct Changeover Day: Arrival time 4pm (may be flexible) and departure 10am. No fixed changeover days. Stays can usually be for any number of nights. Each booking agreed individually to fit in with clients’ requirements (Easter/Xmas min stay required contact owner). Notes on prices: Prices are for the property per week/per month in UK Pounds and US Dollars. All rates include all costs (no added cleaning fees,extra persons or taxes added!). Winter pool heating if required is £45 pw/$70. Please contact me if you require additional heating Special rates/discounts offered for longer stays. Monthly/long-term rates and late bookings/last minute discounts! Please email for further info. For all booking conditions see our website.